Recently Scott Sumner have brought up William Barnett’s new book “Getting it Wrong: How Faulty Monetary Statistics Undermine the Fed, the Financial System, and the Economy”. The theme in Barnett’s book is basically that “normal” money supply numbers where subcomponents of the money supply is added up with equal weight give wrong measure of the “real” money supply. 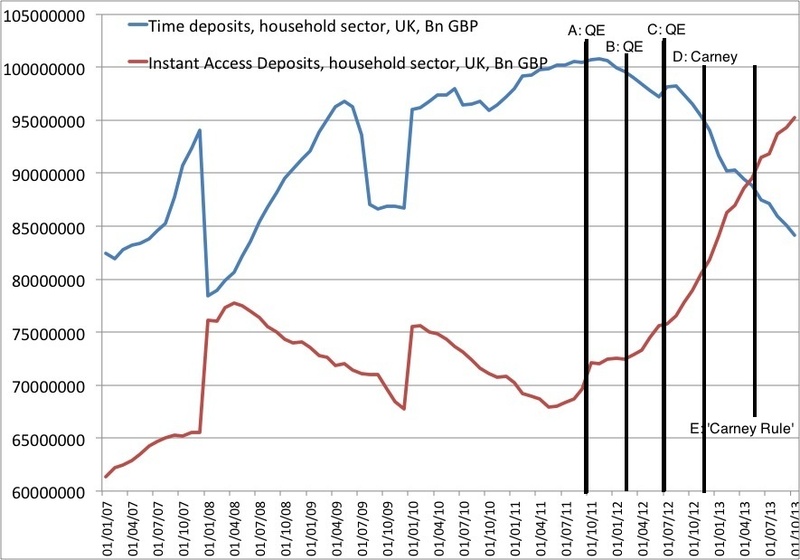 Instead Barnett’s recommend using a so-called Divisia Money method of the money supply. “Blame for the recent financial crisis and subsequent recession has commonly been assigned to everyone from Wall Street firms to individual homeowners. It has been widely argued that the crisis and recession were caused by “greed” and the failure of mainstream economics. In Getting It Wrong, leading economist William Barnett argues instead that there was too little use of the relevant economics, especially from the literature on economic measurement. Barnett contends that as financial instruments became more complex, the simple-sum monetary aggregation formulas used by central banks, including the U.S. Federal Reserve, became obsolete. Instead, a major increase in public availability of best-practice data was needed. Households, firms, and governments, lacking the requisite information, incorrectly assessed systemic risk and significantly increased their leverage and risk-taking activities. Better financial data, Barnett argues, could have signaled the misperceptions and prevented the erroneous systemic-risk assessments. Needless to say I have ordered the book at look forward to reading. 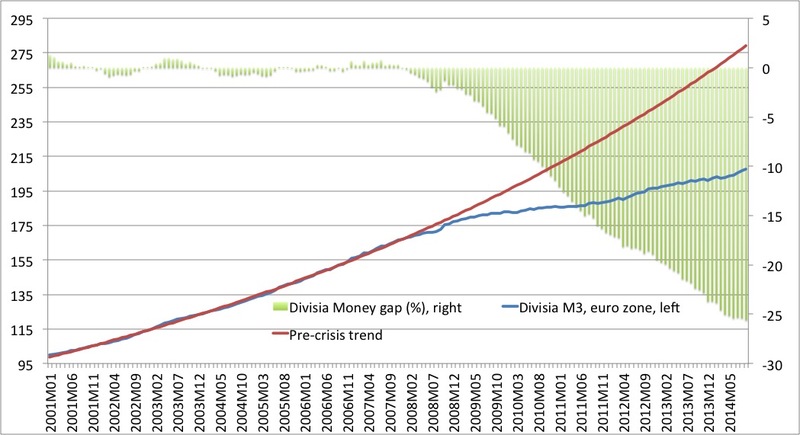 I am, however, already relatively well-read in the Divisia money literature and I have always intuitively found the Divisia concept interesting and useful and which that more central bank around the world had studied and published Divisia money supply numbers and fundamentally I think Divisia money is a good supplement to studying market data as Market Monetarists recommend. Furthermore, it should be noted that the weight of the different subcomponents in Divisia money is exactly based on market pricing of the return (the transaction service) of different components of the money supply. My interest in Divisia money goes back more than 20 years (I am getting old…) and is really based on an article by Steven Horwitz from 1990. In the article “A Subjectivist Approach to the Demand for Money” Steve among other thing discusses the concept of “moneyness”. This discussion I think provide a very good background for understanding the concept of Divisia Money. 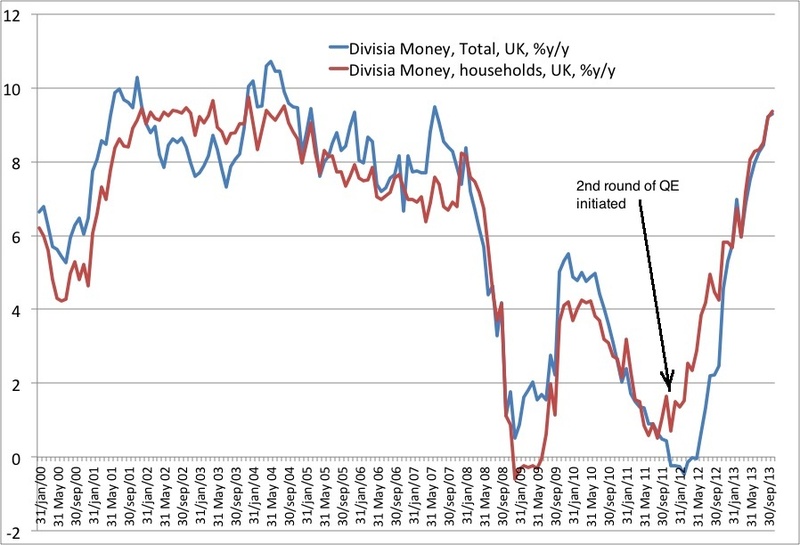 Steve does not discuss Divisia Money in the article, but I fundamentally think he provides a theoretical justification for Divisa Money in his excellent article. “Hicks argues that money is held because investing in interest-earning assets involves transactions costs ; the act of buying a bond involves sacrificing more real resources than does acquiring money. It is at least possible that the interest return minus the transactions costs could be negative, making money’s zero return preferred. While this approach is consistent with the observed trade-off between interest rates and the demand for money (see below), it does not offer an explanation of what money does, nor what it provides to its holder, only that other relevant substitutes may be worse choices. By immediately portraying the choice between money and near-moneys as between barrenness and interest, Hicks starts off on the wrong track. When one “objectifies” the returns fro111each choice this way, one is led to both ignore the yield on money held as outlined above and misunderstand the choice between holding financial and non-financial assets. The notion of a subjective yield on money can help to explain better the relationship between money and near-moneys. One way in which money differs from other goods is that it is much harder to identify any prticular good as money because goods can have aspects of money, yet not be full-blooded moneys. What can be said is that financial assets have degrees of “moneyness” about them, and that different financial assets can be placed along a moneyness continium. Hayek argues that: “it would be more helpful…if “money”were an adjective describing a property which different things could possess to varying degrees. A pure money asset is then defined as the generally accepted medium of exchange. Items which can he used as lnedia of exchange, but are somewhat or very much less accepted are classified as near-moneys. If you read Steve’s paper and then have a look at the Divisia numbers – then I am pretty sure that you will think that the concept makes perfect sense. And now I have written a far too long post – and you should not really have wasted your time on reading my take on this issue as the always insightful Bill Woolsey has a much better discussion of the topic here.